The first line says “About 0b1000110100100100110100000000 results”. 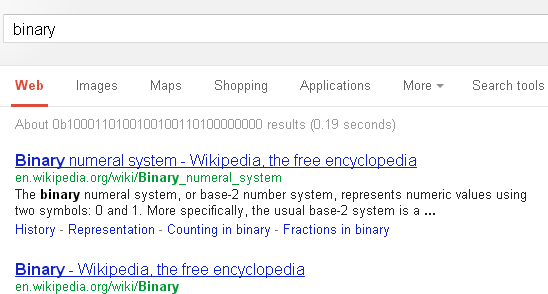 &apos;0b&apos; is the prefix for binary constants; 1000110100100100110100000000 in binary equals 148,000,000 in decimal. This appears only to work for the single term binary; multi-word terms like binary number return the count as normal. You have to be logged out of Google to see this. Update 11/15/12: This is known as an easter egg; this one has been around for at least eight months (for example, see this Youtube video: “Google Binary Easter Egg for Numeral Nerds”). Same for “hexadecimal”: “About 0x189ad40 results”, and “octal”: “About 0o67543500 results”. I can’t find any more (other than “decimal”, of course). It didn’t occur to me to try those — thanks. I just tried ‘roman numerals’ and ‘tally marks’ — nope.